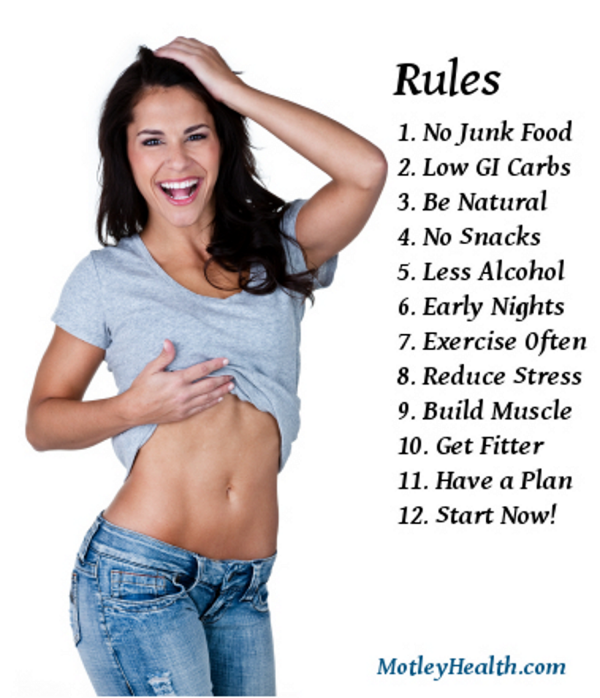 In this guide we provide you with the our diet rules for losing your unwanted fat. We also provide advice on exercising for fat loss – at the end of the guide you will find several of our fitness workouts. If you are looking for advice on how to begin losing weight, you’ve come to the right place! Of all the body changes that people wish to achieve, having a slim waist ranks at the top, along with slimmer thighs (for women) and bigger biceps (for men). A relatively small number of people also wish to achieve one of the greatest fitness goals – six pack abs! Combined with a good fitness plan, these tips will speed up weight loss and get you in shape in no time. Not everyone wants a “washboard abs”, but if you just want to trim down some inches around the waist and get a flatter stomach, these tips can really help you. Even just a thin layer of fat covering your abs can be hard to shift. It takes a combination of strict diet and exercise to tone your abs. Patience and perseverance are the too most important tools when trying to lose some fat! Learning how to lose weight properly is the first step in living a healthier, happier and fitter life! Central obesity, which is mostly visceral fat with a thick layer of subcutaneous (skin) fat, is extremely bad for your health. Losing some fat can greatly reduce the risk of developing serious health conditions in the future such as diabetes and heart disease. There is growing evidence that many chronic diseases are caused by poor lifestyle choices such as poor diet, excessive alcohol consumption, lack of exercise and smoking. However, most people wish to lose their fat simply because they want to have a fitter looking body. Eating more of these foods, when combined with a calorie restrictive diet and exercise, helps to burn all types of fat. Try to include these foods in your diet and you experience improved health and faster weight loss. For more advice on food read the section about healthy foods choices. It is not just healthy food though, you still have to control how much you eat (i.e., Calories). To lose fat you have to throw out the junk food. You are what you eat, so don’t eat junk. Do not keep junk food like cookies, chips, sweets and other similar products in your house. Junk food and addiction to sugar is considered to be the greatest cause of weight gain today. If you do not have these bad foods lying around, you will not think about them and after sometime, you will break the bad eating habits. Most weight loss plans provide excellent nutrition advice and motivational tips to help you keep your healthy diet on track and this is essential for losing weight. But, why is junk food so good at increasing fat ? Mostly it is due to the high sugar content of junk food. Most junk food consists of refined carbohydrate and sugar, which when eaten quickly raise blood sugar levels, leading to reduction in fat burning and increase in appetite. Many people who ask us how to lose fat think that all carbs are bad, based on what they have read elsewhere. However, consumption of carbohydrate is essential for losing fat, but there are good carbohydrate and bad carbohydrate. Refined flours and the foods that they create, such as white bread, pasta, donuts, cakes and biscuits (yes, biscuits cause weight gain) should be avoided. They can cause bloating, poor digestion, and lead to accumulation of fat, which is the opposite of how to lose fat! “Good carbs”, such as fresh fruits and vegetables, should be eaten instead. Slow release carbohydrates are also beneficial, such as oats, brown rice, some pulses and sweet potato. A diet that takes most of its carbohydrate from fruits and vegetables, as opposed to refined flours, is healthier. Our Low GI Diet Plan – ebook! 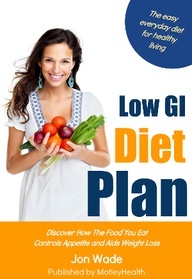 Our Low GI Diet eBook teaches how the glycemic index can help you to lose weight. Ideally granary or wholemeal bread should be eaten instead of white bread, and biscuits / cookies and cakes should be avoided. Consuming too much carbohydrate can bump up your insulin level, which can slow down your metabolism (insulin stops the body breaking fat down), and this is why too much sugar causes fat. Your body cannot metabolize too much carbohydrate at once because the body does not need so much energy at once. The excess sugar from the carbohydrates will just turn into fat. For a more complete explanation of this process read our page, What Is Fat? Much research has shown that adopting the Atkins Nutritional Approach, i.e. a high fat/protein diet, is the way ahead to lose weight fast. Avoiding carbohydrate increases the fat burning metabolism (lipolysis), which helps to reduce fat, which is a key element to your diet plan. Combining your meals with a good mixture of protein, carbohydrates and vegetables is a good way to lose some fat. Your source of protein should be in the size of a deck of cards; the carbohydrates in the size of your palm and the major bulk of your meals should come from vegetables, ideally low GI vegetables. It is important that you avoid gimmicks and pills when try to lose weight. You need to make a lifestyle change and carry on eating a healthy diet and exercise after you lose weight. Systems such as the Lemonade Cleanse / Maple Syrup Diet may aid fast weight loss initially but in the long-term there is a much greater risk of putting the weight back on again. Slow and steady is best. Try not to have late night snacks – this is often one of the quickest way to lose fat! The main problem with late night snacking is that there is not much activity done afterwards. People go straight to bed right after the late night meal because they are tired. This results in high sugar levels in the blood stream and because no energy is being spent after the excess sugar turns into fat very quickly. You can reduce you hunger and food cravings by following a low glycemic diet. Losing weight requires a strict diet so avoiding hunger is essential. Late night snacking is often emotional eating and not eating to nourish. For men especially, alcohol can be a huge problem and cutting down on beer is another quick way to lose fat. Excess alcohol consumption can really give you a “beer gut”. Have you seen people who are slim all over but have a beer gut sticking out? That is the effect of excess alcohol consumption. It is important to decrease alcohol consumption if you drink a lot because frequent drinking (of alcohol) causes the accumulation of visceral fat. Most of the additional the energy consumed through alcohol will be stored as visceral fat so if you want to lose weight fast then you need to stop drinking for a while. You do not need to give up alcohol completely to lose weight, but just drink in moderation. Do not drink everyday and limit yourself to just one glass of wine or one bottle of beer. Losing weight really does all come down to a calorie deficit. Even if you are reducing the empty carbohydrates and eating low GI vegetables and lean meats, you still need a calorie deficit to lose fat. Many people insist that it is not how much you eat but what you eat; this is only partly true and as we have discussed before, all diets are equally effective. The basic rule of losing weight is that for every calorie deficit of 3500 Calories you will lose one pound of fat. This is because one pound of fat contains around 3500 Calories of energy. To lose 2 pounds in one week you need a total calorie deficit of 7000 Calories, which is 1000 Calories a day fewer than your body needs. Note that this is not 1000 fewer Calories than you current eat; this figure is not important in the weight loss calculations. The only people who lose significantly more are those who are extremely overweight – they can lose five to ten pounds in a week. For a daily deficit of 1000 Calories you need to follow a strict diet plan. Exercise will help, but diet really is the key. Sleep research has shown that sleeping with a light on, even just a dim night light, is enough to cause changed to appetite. Researchers found that subjects who sleep with a light on gain more weight, so turning out all the lights at night can help you to lose weight. Exercise is vital for weight loss and long-term health. Exercising has an immediate effect on weight, in that as you exercise you burn energy (mostly glycogen stored in muscle tissue). The body replaces the lost energy by breaking down sugar reserves in fat cells. This is why we lose weight (fat) when we exercise. Exercise also helps build muscle and this means that your metabolism is raised permanently, which helps to keep your weight under control. Finally, the more exercise you do, the fitter you get. The fitter you are, the more you can exercise and the more calories you burn. If you do not know how to get started, find a fitness class, hire a personal trainer or learn from or guides. Below is our essential guides to exercising for fat loss. What Type Of Exercise Aids Weight Loss? 1. Abdominal Crunches: Do They Work? In short – no, they do not. Crunches are done to develop the abdominal muscles. This will not cause your abdominal fat to melt away. For that you need cardiovascular and full body workouts, not just crunches. However, crunches are an important part of your overall fitness – a strong mid-section makes you more athletic, more stable and will help in many aspects of life in general. 2. What Is The Best Exercise To Lose Fat? The question that is so often asked – what is the best exercise to start losing weight? But it has now finally been answered by sports scientists; researchers from the Duke Uni Medical Center have found that aerobic exercise is more effective at burning visceral (stomach) fat than weight training. This fat is the least healthy – it causes diabetes, heart disease and some forms of cancer. “Resistance training is great for improving strength and increasing lean body mass. But if you are overweight, which two-thirds of the population is, and you want to lose fat, aerobic exercise is the better choice because it burns more calories.” – Dr. Cris Slentz, Duke University Medical Center, 2011. However, many fitness instructors and personal trainers get excellent results from a combination of cardiovascular and resistance training. One theory is that by performing a variety of different exercise you activate more metabolic pathways which can speed fat loss – you literally lose fat faster. One big advantage of doing some resistance exercise as well as cardiovascular is that you can exercise more. If you are unfit and have not exercised in years, or decades, it is often easier to do a longer session in the gym on resistance machines than it is to perform intensive cardiovascular exercise for the same duration. If you have left it almost too late to lose weight, then follow the MotleyHealth 7 day exercise and diet plan to help you lose as much weight as possible in one week. Remember to do intensive cardiovascular workouts, compound weight training, and control your calories intake first, then target your abdominal region with some of these exercises. Many of these exercises will help you to tone the muscles to help lose lower abdominal fat as well as build stronger and more visible abdominal muscle. The key to losing fat is to exercise often. We suggest exercising at least 7 times per week. If you can fit in 2 workouts a day all the better. Although sports research has indicated that intensive exercise is most effective, this new research suggests that really it is just a matter of burning more calories. Whether you spring or walk makes little difference, so long as you do the work. Sprinting obviously burns calories quicker than walking but if you can only walk that just means is that you have to exercise for longer each day. There are many exercise routines that will help you to get a 6 pack once you have lost all your excess fat. The most important thing is to combine different workouts. Weight training is essential, as building muscle speeds metabolism. Intensive exercise, such as interval training and circuit training burns fat fast. Keep it varied, and you will lose weight. Remember that although stomach exercises will not help you to lose fat, they will help to tone the mid-section and develop your abdominal muscles. If exercise is simply not an option for you then you should read the section on How to Lose Weight which explains the role of food, hormones and fat loss. Although diet plays the most important role in losing weight and body fat, exercise really is essential. Fortunately there are some fitness and weight loss plans that are tailored to help people lose weight. We have many workouts in our fitness section. There is really no single “best exercise” to lose fat, what is important is that you do exercise on a regular basis and burn as many extra calories as you can. For people who are very overweight and obese, exercise can be very hard. So let’s take a look at how to start exercising when you are obese. Being obese certainly does not stop you exercising, however, the severity of your obesity will impact what you can and should do. If you are only moderately obese, then you should be able to start most exercise programs – just take it easy to start with. If you experience any pain in joints, such as knees, ankles, hips, then you should rest and recovery before carrying on. If you are very obese with mobility issues, then you need to be much more careful. One good option is walking with Nordic walking sticks, as these will give you more support, better balance and take stress off your lower joints. Swimming is another very good option, as it places no stresses on your joints. The main purpose of fat is to protect the vital internal organs and to lose all of it is to defy nature; this is why it is so difficult to achieve. You can do it if you stay focused and work hard. The fat that surrounds the internal organs can be burnt off with intensive exercise. weight training and a sensible low sugar diet. MotleyHealth.com provides many well structured diet plans which provide the best ways to lose fat. This really is the key to training your body how to lose fat. There really is no one single trick; you have to adopt multiple lifestyle changes to improve your diet, be more active and get fitter. It takes time, but it is never too late to get started. We are here to help. We hope that you find our weight loss article useful. You should now have a good idea of how to lose weight. The trick now is to put this information into action. If you have any questions please ask below. “The Effects of Aerobic versus Resistance Training on Visceral and Liver Fat Stores, Liver Enzymes and HOMA from STRRIDE AT/RT: A Randomized Trial” by Cris A. Slentz. Am J Physiol Endocrinol Metab August 16, 2011 ajpendo.00291.2011. Abstract – ncbi.nlm.nih.gov (accessed August 2011). “Busting Food Myths with Nicole Senior” GI News. Accessed Sept. 2011. “Effects of an Energy-Restrictive Diet With or Without Exercise on Abdominal Fat, Intermuscular Fat, and Metabolic Risk Factors in Obese Women” by Ian Janssen, Anne Fortier, Robert Hudson, and Robert Ross. Published in Diabetes Care March 2002 vol. 25 no. 3 431-438. Abstract – DiabetesJournals.org, accessed June 2008. “Exercise-induced reversal of insulin resistance in obese elderly is associated with reduced visceral fat” by Valerie B. O’Leary el al, Journal of Applied Physiology May 2006 vol. 100 no. 5 1584-1589. Photo credit: Glenn Francis, Pacific Pro Digital.